I went out a few days ago and noticed for the first time, no one was home at the nest. I didn’t think much of it, looked again that evening and again no one was home. I got up the next morning and looked again and still no activity. I was beginning to assume there could be only one reason for the nest to have been abandoned, and it could only mean the young did not survive. However just because I didn’t catch anyone at home, it did not mean the worst case scenario, it was mere coincidence. I have seen them several times of late and got a few pics. 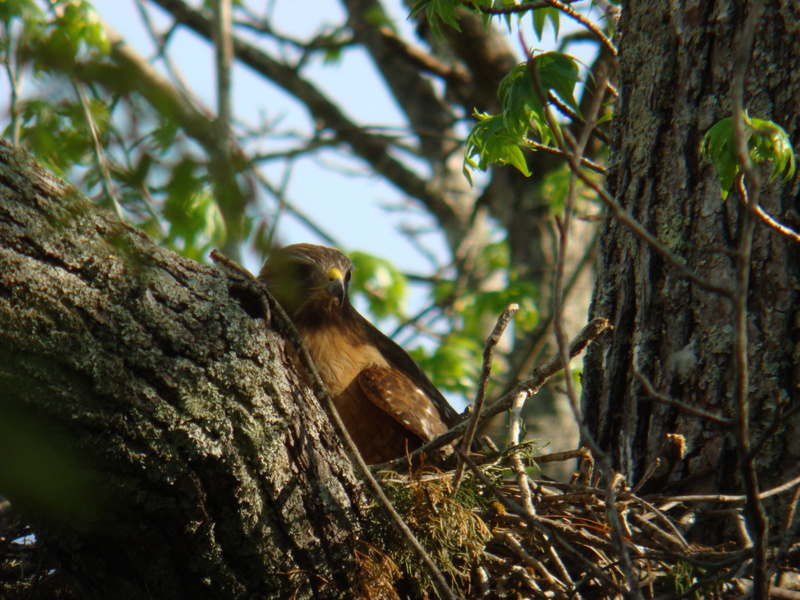 I was also able to verify at least one chick in the nest with a binocular observation. I thought I saw a wift of white the day previous but it was fleeting and it was not visible again. Today while I was out observing the nest I definately saw it again. A movement of a fluffy white, very downy looking, little hawk. It was as if it was trying to stand for a moment and just could not maintain, and fell back down. Once I was just out with binoculars and saw one of the parents hunched over, while it was facing away from me I got the impression from it’s behavior it was stripping meat from some poor critters carcass, though I did not have time to confirm it. I have a pic, though where it looks like a parent standing by with a small piece of critter to feed the young. Things are really starting to green up. The leaves are coming in quick, and with the wind blowing and trees swaying these leaves are proving to be difficult to get a good shot around. This was a rare finely focused shot, but a bit of green kept it from being a great shot. Stay tuned. I will keep after these guys until the little one/s are all grown up. 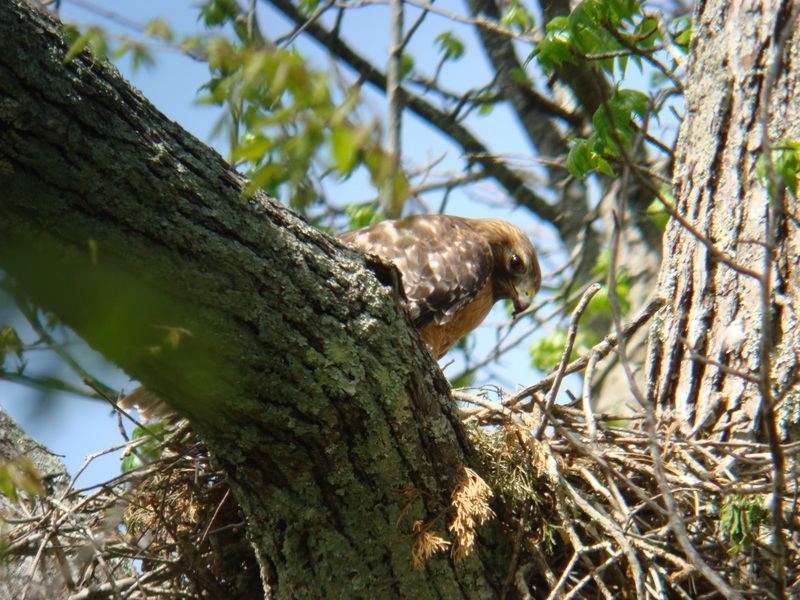 This entry was tagged Hawks in my Tree, Red Tail Hawk Nest With Young, Red Tail Hawks. Bookmark the permalink.